Another creation from Bobby at Pat's Corner - a shrine frame for my little Virgin Pacifica, a paper mosaic. Shrine and painting together are about 20 x 24 or so inches...the shrine is so incredible with all sorts of interesting do-dads - cuckoo clock parts, a crucifix, wood gingerbread, even a little compartment for a rosary or something. 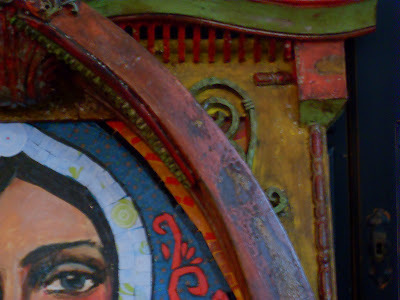 It looks like a mexican retablo or a piece in a church somewhere in Provence. 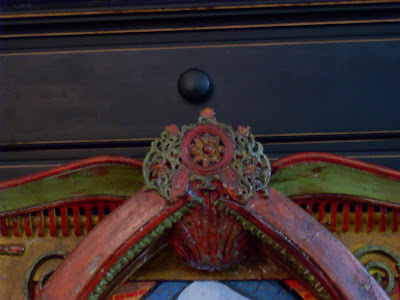 This is the little arched piece - with what I think is a cuckoo clock part and with swirly wood trim on each side. There's a special little grid, too and the paint is distressed, layered, rubbed, bubbled...it is more than sensational. 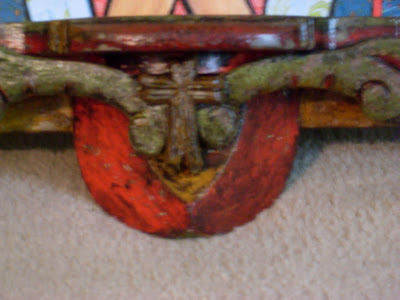 And on the bottom part of the frame...the crucifix and above it, a little well for a rosary, or holy water (if you add something water proof in there) or just a neat little hideaway. 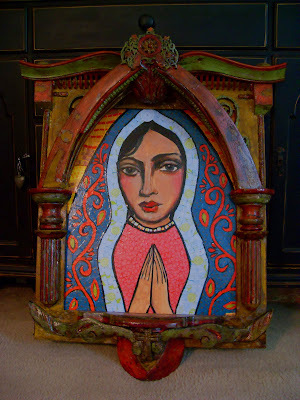 The Virgin is sweet and a lot of work has gone into the mosaic pieces - it is varnished with resin and she is very pacifica. Please leave a comment if you are interested in this piece or in commissioning a similar piece and shrine.